Update June 3, 2017: Following the initial beta release, a patch has been released which fixes Vanquish’s 60fps damage glitch. Not only has the damage of the lock-on laser been correctly adjusted, but the actual lock-on timing should now be correct for those playing at 60fps. If you were previously using the beta version of this patch, Sega now urge players to switch back to the main branch so you will receive all future updates. For everything else regarding the Vanquish PC port, we’ve got our very own port review covering all you need to know. Along with this main damage fix, various bugs have been dealt with like certain cutscenes playing at the wrong speed and events failing to trigger when playing at 60fps. Hopefully, Vanquish players should experience no more issues when playing at the higher speed, but let Sega know if you experience any problems. 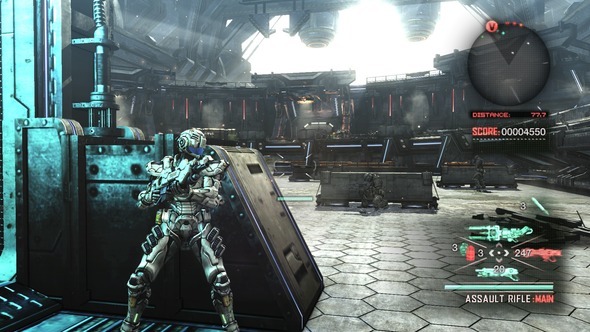 Update May 29, 2017: The developers have acknowledged and issued a beta patch for Vanquish that aims to fix a number of issues, some of which are relate to the game being more difficult at a higher framerates. There’s a few different things getting fixed, but the game’s invincibility frames and health regeneration should work as intended at high framerates now. The patch hasn’t been tested by the QA team, though, so there’s definitely a few risks in installing it. Today’s a holiday in the UK, so hopefully it should get tested and made fully public tomorrow or later this week. Since release, they’ve also added unsupported features for increasing the FOV and removing the borders, although, again, these may have unintended side effects. For full details on how to download the patch, read the official discussion page. Original:For some reason, games get really weird if the fps is through the roof. Vanquish is no exception: some folks over on NeoGAF have worked out that those of you who play on a higher fps take more damage from enemies. .:Wesker:. on NeoGAF tested this out with one of the tutorials, and the results are pretty clear. Where an effect upon getting to low health will activate after six or seven seconds of taking damage at 30 fps, it only takes a couple of seconds at 60 fps. It’s not a one off, either, and seems to be a constant if you are at 60 (or higher) fps. While there’s no official recognition of the bug yet, there’s a chunk of anecdotal evidence in the thread. Valkyria Chronicles supposedly had a similar problem for a while, but that eventually got patched out. If you’re desperate to play but you’re having this problem, it might be best to wait things out to see if this gets patched out, or just get really, really good at the game. It has been reported, though, so hopefully the right people are fixing it as we speak.